After the first part of the 10th World Choir Games in Tshwane, South Africa was finished, it was time for a special concert: The Nelson Mandela Legacy Concert, which was organized by INTERKULTUR in cooperation with the City of Tshwane. The special thing about this concert was the social focus: There were no entry tickets sold. Instead everybody had to bring a blanket, a pair of shoes or a bag with toiletries to get in. After the concert these things were donated to the most needy people of the city. 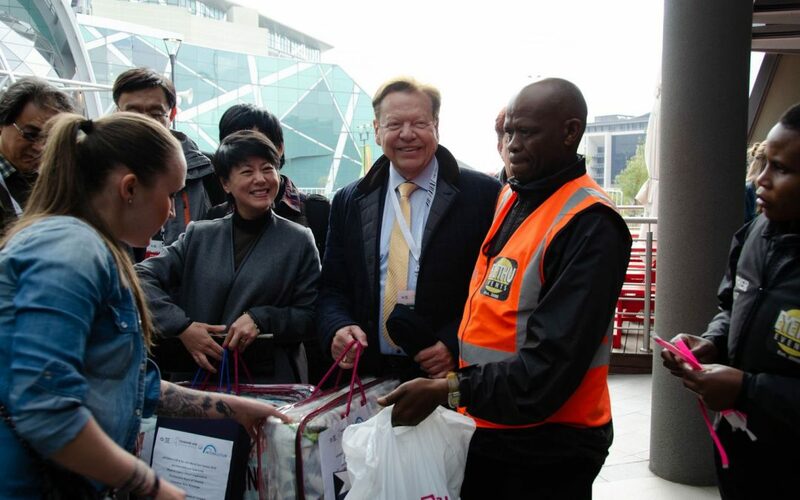 INTERKULTUR President Günter Titsch, who invited several Township choirs from Tshwane in advance to the World Choir Games to give them the opportunity to participate, attended the concert and donated some blankets and several bags of toiletries. The Executive Mayor of the City of Tshwane, Solly Msimanga, thanked all visitors and reported already 9 big boxes full of donations in the beginning of the concert. Furthermore, he explained that the city is trying to arrange such a concert every year from now on. The concert included a broad variety of African music: Choirs from all over Tshwane as well as from different countries of Africa presented a colorful program. In addition, the South African Police Service Symphony Orchestra and a Marimba group played. The audience was thrilled and showed this with loud cheering and applause. INTERKULTUR is proud to support needy people in Tshwane with the Nelson Mandela Legacy Concert and thereby bringing a persisting effect as part of the World Choir Games to the host city.